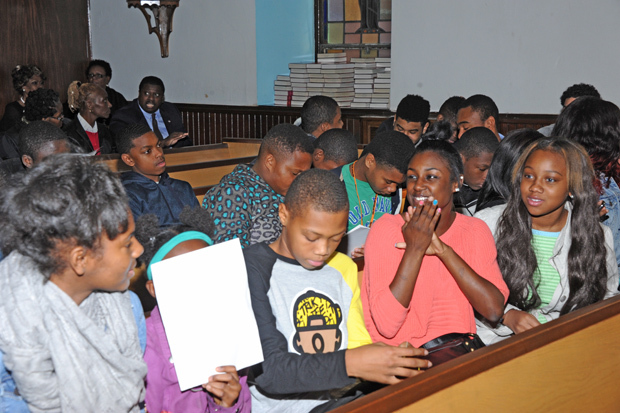 St. Ignatius of Loyola Church in West Philadelphia hosted the 52nd annual celebration of the canonization of St. Martin de Porres with a prayer and praise liturgy Sunday afternoon, Nov. 9. 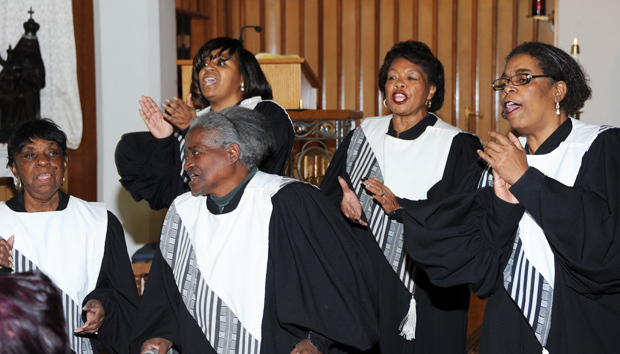 More than 500 people filled the church for the two-hour program, coordinated by the Archdiocese of Philadelphia’s Office for Black Catholics, which featured prayers from pastors serving predominantly Black Catholic parishes in the archdiocese and music from three local choirs. Msgr. Federico Britto, pastor of St. Cyprian Parish, delivered the homily. Among those recognized was the Martin de Porres Foundation, which provides scholarships and subsidizes programs in the African American Catholic community. The program opened with the St. Charles Borromeo Gospel Choir singing “God is Good all the Time” and “I am a Friend of God.” The selections were conducted by Ann Tymes and Bernadette Brooks, respectively, with Earl Knight on piano. 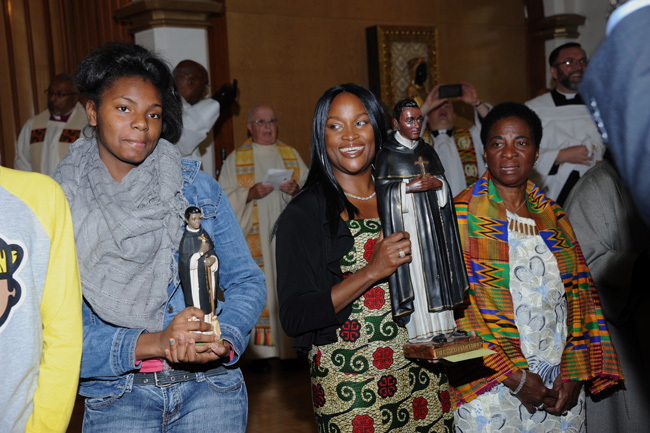 During the opening procession many people displayed icons, paintings, statues and even a stone sculpture of St. Martin de Porres, who was born in Lima, Peru on Dec. 9, 1579, the son of a free African mother and Spanish father. Martin became a Dominican brother and earned a reputation for being a social justice advocate for the poor and for those of mixed ethnic heritage such as himself. Martin was beatified in 1837 and canonized by Pope John XXIII in Rome on May 6, 1962; his feast day is Nov. 3. He is the patron saint of African American Catholics, mixed race people, innkeepers, barbers and public health workers. At Sunday’s liturgy, Father Kelly used incense to bless the icons before the St. Charles Borromeo Choir, featuring Brooks as the soloist, brought members of the full congregation to a standing ovation. “Reflect on the life of St. Martin de Porres,” Msgr. Britto told the people in his homily. He pointed out that the saint was who lived in Latin America. 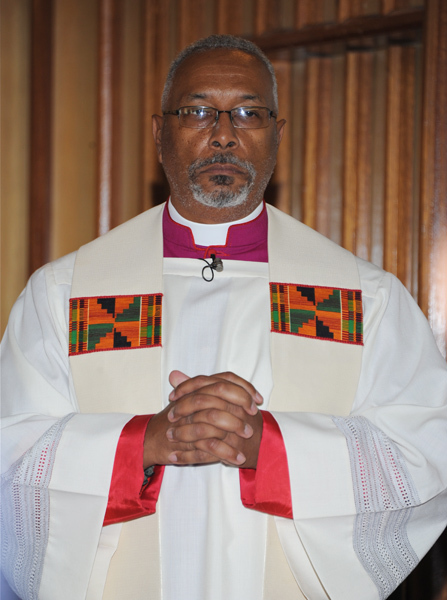 He drew parallels between how the old TV sitcom “The Cosby Show” showcased an upper middle class intact African American family drew criticism in its day from some people, just as venerating St. Martin de Porres did. Msgr. 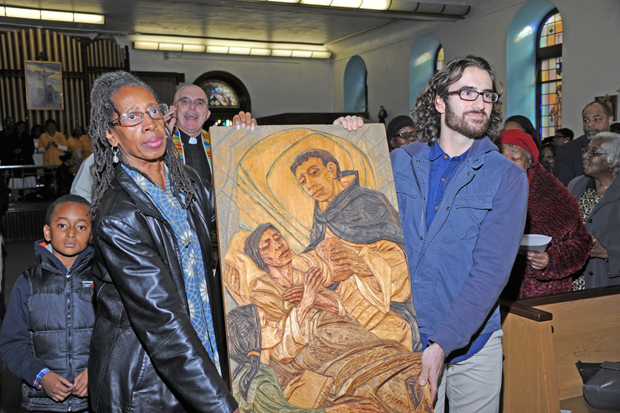 Britto drew thunderous applause as he noted that the thing that kept the television show alive was the love it showed, just as the celebration of St. Martin de Porres continues because of the love among Catholics, particularly those of color. “Martin was blessed by God and he grew in faith and love,” Msgr. Britto said. The prayers of the faithful alternated with local pastors, beginning with Msgr. Wilfred Pashley, pastor of St. Barbara Parish in West Philadelphia, who prayed for the youth. Father Scott Brockson of St. Katharine Drexel Parish in Chester prayed for the unity of all baptized Christians before Father Stephen D. Thorne, pastor of St. Martin de Porres Parish in North Philadelphia, prayed for “a new page in African American Catholic history” during November. The month is National Black Catholic Month. Then Father Sylvester Peterka of St. Vincent de Paul Parish in Germantown and Father Joseph Okonski of St. Athanasius Parish in West Oak Lane prayed for social justice and for immigrants and refugees, respectively. Father Rayford Emmons of Holy Cross Parish, representing the three Mount Airy worship sites of that community, prayed for those who hunger both spiritually and physically, as well as for vocations. Finally Father Christopher M. Walsh, pastor of St. Raymond of Penafort Parish in Mount Airy, prayed for families before next year’s World Meeting of Families and the possible visit of Pope Francis in Philadelphia. Those present were invited to the school hall for fellowship and refreshments following the liturgy. Nice article but I don’t see any mention of our choir, St. Ignatius, who also sang. They did a great job under the direction Rita Stewart-Bostic.